When not Calling our Resident Callers are on the floor dancing using their knowledge and experience to assist in sets when needed. Howard Burrows: I joined Truro Folk Dance club in 1980 with my wife Margaret when invited to come along to the Royal British Legion in Truro. The club later moved to Kea Community Hall, Playing Place, Truro in 1990 and has continued there to date. I started calling a few dances within the club and later called at public functions starting in 1993 with a charity dance in a garden in Playing Place, Truro. I find public and club calling very rewarding and look forward to every event, the planning stage as well as the function. I am one of the 4 Resident callers and also call at private wedding parties, birthdays and many other social events within Cornwall. I was elected honorary secretary in 1991 for our club and held this position for 26 years. I took over the running of the New Years Eve dance in 2001. 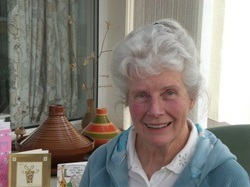 Beryl Jukes: I was first asked to teach country dancing at Landscove Devon in the ‘Fifties’after a training course led by Margaret Grant,(SW Area Organiser of the EFDSS) I then moved to Headington, Oxford and was invited by Douglas Kennedy to be an Area Representative for the EFDSS in Berkshire. I gained experience of teaching dancing to people with sight and hearing problems at this time. After moving home to Cornwall I started a club in Newquay and was asked to be resident caller for a new band -Thunder and Lightning. Over the years I have been the caller at various clubs such as Kenwyn (now Illogan), Tregony, Withiel, N Kerrier U3A,Carbis Bay and Fraddon. I also call in turn at Truro. I love traditional music and play my accordion at every opportunity. I do frequently cross the Tamar to call at dance weekends, clubs and festivals. I consider dancing to be a great social opportunity to promote friendship, fun and a healthy lifestyle Dancing has taken me to Germany, Shetland, Holland, Denmark, Canada and America and I consider myself fortunate to have encountered so many interesting and lovely people. Frances Oates: I began folk dancing as a teenager and danced with clubs all over Cornwall. I started calling a few years later. Since then I have called for barn dances, dance clubs, Christenings, Weddings, and Wakes as well as calling at Festivals and residential weekends. I am the resident caller at Illogan Folk Dance Club and also call on a rota basis at Truro Folk Dance Club as well as travelling further a field to call for clubs out of county. I enjoy dancing and calling English/Playford and American styles and I firmly believe that dancing should be fun and that it is the best way to keep fit, both mentally and physically. I organise the North Devon Folk Dance weekend held annually in October now held at Paignton. I was the Minutes Secretary for the Halsway Board of Directors at Halsway Manor in Somerset, which is the national residential centre for folk arts. Peter Strevens: I originally started dancing in 1967 in the Millbrook Square of the then Kernow 900 Folk Dance Club and enjoyed dancing throughout my youth into my early 20s at all the Clubs throughout Cornwall. Due to career commitments I was unable to dance until my retirement when I happily took it up again joining Truro Club and supporting the other Cornish Clubs when possible. I was canvassed intensely by Shelagh Lynham to start calling with a view to possibly succeeding her when she stood aside, this I undertook and eventually I was invited to replace Shelagh on the Truro Clubs caller rota. I find all aspects of Club and social dance calling engaging and rewarding and look forward to each event and preparing for it. I am currently Chairman of Truro Folk Dance Club. Ken Warren: A convert from ballroom dancing back in 2012, I had my first taste of Folk Dancing. It was something that I took to and enjoyed immensely, using every opportunity to further my dancing experience. I have attended most Folk Dance Clubs in the area, courses at Halsway Manor and Folk Festivals in Denmark and this country on a regular basis. Initially I had no thoughts of calling dances, being content to just enjoy the dancing; although as time went on I became increasingly fascinated by the different styles and methods used by each of the callers that I came across. Finally, in 2014 as a result of encouragement from Beryl Jukes, I decided to give calling a try for myself; I found it was something I could do and liked. Following this I have since called at every opportunity wherever I have gone and dabbled in the writing of dances. Every dance I call I learn something from and my aim is one of continuous improvement. Thanks are due, to my mentor, Beryl, for her generous help and advice, and having faith in me. For inspiration, Geoff Cubitt, the ultimate caller, who I strive to emulate yet will never achieve; and Beth Molaro with her logic, for giving me my “light bulb moment” as to how it should be done. My only regret in all this is that I didn’t come to Folk Dancing sooner in my life, which perhaps is why I want to pass on “the world’s best kept secret – Folk Dancing”, as I’ve heard it called, to as many younger people as I can. Dancing is good for us in mind and body, with such fun to be had along the way, and I shall do my best to perpetuate that.